The Run: Giant Gap is a classic run with great canyon wilderness scenery and two spectacular vertical walled gorges. Its down side is that it has inconsistent difficulty, and were there easy mid-run access, it would likely be paddled as two different sections. It can be paddled as a 2 day run, but that is uncommon these days, most groups choose to meet very early at the Colfax-Iowa Hill Road camp ground to set shuttle. An 8am meeting here should see a group off the river by 5pm with a leisurely pace which is fine in May but a problem in January. From the putin boaters are faced with a 1.5mile, 1700 foot descent down a well defined trail that contours and switchbacks down to the river. This trail starts rocky but quickly becomes leaf covered and common practice over the years has had boaters tying a sling to front and rear grab loops and dragging (or being dragged) to the river which should take about 40 minutes. Whilst poison oak lines the brush either side, the trail its self is free from any vegetation. The trail hits the river at the Euchre Bar footbridge by a large slow moving pool. Moving downstream the run is immediately class III water and quickly enters the first vertical walled gorge, which in wetter months can have a spectacular waterfall running down the wall. No harder rapids are encountered in this gorge, just the odd larger hole and the river emerges into the open space of Green valley and eases to class II/III. Giant Gap can be seen approaching downstream, a narrow gorge between 2000 foot rock faces. Just before entering Giant Gap proper a rapid with undercut house sized rock center is encountered. A large tree trunk had been pinned to this rock for many years until it was washed downstrem in Dec 2010 floods. As Giant Gap is entered the difficulty climbs to class IV, and Grater is encountered, a congested shallow rapid whose blind line is not immediately apparent but is generally run far left then back to centre. The left side of Grater was changed for the worst in Dec 2010 high water, becoming a little more manky. Soon after an obvious horizon line with right side cliff and headwall, is encountered, frequently with sunlight clouds of water vapor for added atmosphere. This is Nutcracker, the first class V, a rapid that leaves most people grinning and is simply run down the gut crashing through the wave holes. Easy water for 200 yards leads to an eddy against the right wall under the cliff face with a view of two midstream rocks. This is the scouting eddy and possible portage for Locomotive falls. The water in the eddy is shallow at reasonable flows, and an easy rock climb (5.3) must be made to gain a ledge on the river right. 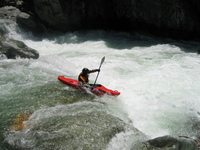 At moderate flows most teams just run without safety, staying right and running a tongue visible at the last second hard right over the final drop. It seems that in general Locomotive falls is somewhat easier as of 2007 with the tongue being more pronounced and the typewriter effect left being less pronounced. A pool and large eddy lies below the drop, but at higher flows a swimmers equipment can easily be swept downstream leading to a formidable problem in this vertical walled section with little walkable shoreline. Difficult class IV or easy class V rapids (depending on flow) continue now for some distance with many possible good lines. When in doubt, sneak lines left almost always seem to yield successful outcomes. The scenery eventually opens out into steep wooded canyon again, but the difficulties are not over. Class V- Dominator lies about river mile 5 and is heralded by a large boulder garden with most flow going left and a downstream cliff visible on the left. The conservative scout is immediate along the rocky right shore for 100 yards. The committed scout is from a left side eddy immediately above the last drop. Dominator was changed in early 2009 when the rock that formed the final boof over hole move collapsed making the rapid easier but less aesthetic. The line now runs just to the left of a large boulder in a steep banking left turn with no significant hole. At higher water class IV sneak can be worked the whole length of the rapid far right but its shallow and pinning is a real possibility. Fun rapids continue class IV for sometime but eventually gradually ease. A great lunch spot lies about river mile 6 by a right side waterfall. Somewhere in the middle of the run a steep class III rapid is found to have a large under cut center rock which has caught many people out and caused more swims than might be expected. Otherwise the next 8 miles are largely class II/III water with the odd surprise hole and great scenery. Around mile 14 alert paddlers will have already observed subtle changes to the geology and suddenly a large long rapid, Pinball, is encountered. This rapid has the look, hazards and feel of downstream Chamberlain falls rather than Giant Gap, and an eddy left at the top can be caught. A quarter mile downstream the takeout is found river left. Put-in: Euchre Bar trailhead, google map. Park here and then follow the hiking trail 1.5 miles to the river at Euchre Bar bridge. There is pool to start in and a few easy rapids to warm up in. Grater signals the start of Giant Gap proper and the main difficulties. It is a shallow, congested and rocky rapid and at lower flows very boney. People generally run it left, and aggressive boat scouting is generally sufficient. Nutcracker is formed where the river flows over a rock fence then constricts tightly whilst steepening, being constrained by a vertical cliff on the right slide and downstream a large round boulder on the left. Boaters arriving at the horizon line are often greated with no better clue as to a line than a cloud of mist rising from below. However this rapid turns out to be quite forgiving, though wonderfully boisterous. People generally enter center through right of center through a gap in the submerged rock fence then just head center, paddle hard and hang on! The rapid is composed of breaking waveholes and staying upright and straight is the main problem. The rapid empties into a deep and slow pool at normal flows. Above 1,500 cfs this becomes a dangerous river-wide ledge hole. Scout on river right by exiting boat into shallow water and scaling granite cliff (5.3). The portage is also on river right and requires team work to pull boats and paddles up the cliff. Rafts can line down the right. The rapid seems to have changed somewhat for the better in recent years (2007) and there is a more pronounced tongue hard right and less of a leftwards typewriter effect afterwards. Dominator is the last of the big named rapids in Giant Gap, and at this point the canyon is already opening out from the cliffed out narrows of the inner gorge. It starts with a busy boulder garden with most flow trending center and left. Sneak routes appear to the right and can be used but have significant pinning potential. Following the main flow left leads to a commited eddy on the left that can be used to scout the final large drop. From this eddy split the two large boulders center in a steep banking hard left turn. More timid boaters are advised to scout immediately right rather than entering the initial boulder garden. Pinball lurks at the very end of the Giant Gap run, ready to catch the tired and weary after the seemingly endless miles of class II/III. Its geology and nature is similar to that of downstream Chamberlain Falls than the major rapids of Giant Gap. Catch the last eddy on the left as the channel becomes obviously constricted by large boulders and pick your line. An ugly looking cave lurks under the boulder top right of the rapid. This gauge is located well downstream of the run and especially in early season a considerable amount of the reported flow can be from side creeks downstream of the crux of Giant Gap. By April-June with drier weather most flow reported will be passing through Giant Gap from high elevation snow melt from slopes behind Squaw Valley and Sugar Bowl. Lower flows are still fun in the harder rapids in Giant Gap but make for a long paddle out at the end of the day. Higher flows make Locomotive falls a more serious proposition and lost equipment in the early walled out gorge sections could be a real disaster.